Summer in Finland can be tricky. Most people retire to their summer cottages, many of which are located by one of the country’s 190,000 lakes; the cottages provide a respite from the metropolitan hustle, a quiet interlude with space to pause and reflect. It’s easy to feel comfortably isolated, but you quickly learn to be cautious about baring your soul by the lakeside. Sitting by the water’s edge last week, my partner and I were struck by how easily we could hear our neighbours across the water. This isn’t a special property of Finland or even of Finnish lakes. It’s just that sound travels better over water and Finland has quite a lot of lakes dotted with lakeside cottages. Why is it so easy to hear things across open water? Sitting outside our cottage last week, my partner and I speculated that the lack of obstructions might have something to do with it. The flat surface of a body of water offers few obstacles to sound — there aren’t any trees or rocks or buildings in the way. That probably helps a bit, but it turns out it’s not the real reason. If it was, you’d experience the same effect if you were standing in a meadow or a field. The real reason has to do with the way air temperature affects travelling sound waves. The sounds that we hear are actually pressure waves travelling through the air. The speed of sound depends on the temperature of the substance it’s travelling through. In air at 20°C, sound travels at 343m/s, but that changes by about 3m/s for every degree centigrade; in 10°C air, sound travels at only 337m/s. When you make noise, sound waves travel away from you in every direction, making an expanding sphere. Since the air just above an open body of water is cooler than the air slightly higher up, the speed of sound is slightly lower above the water’s surface. 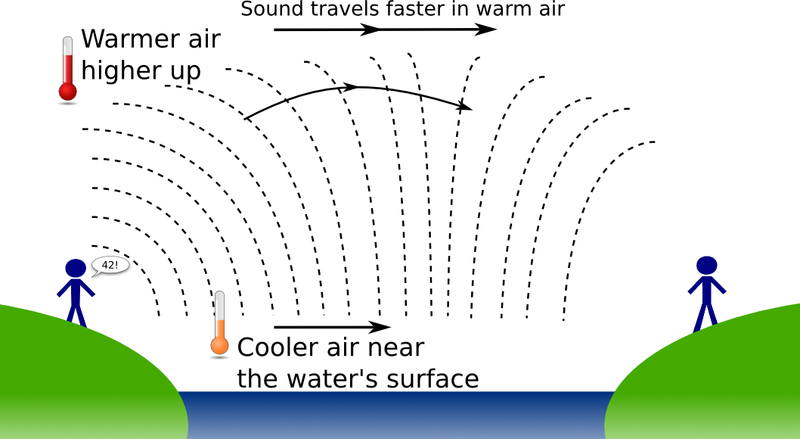 The temperature gradient above the water translates into a gradient in how fast sound travels; sound waves further from the water will be faster than those below them. The difference in speed causes the expanding sphere of sound to change shape, flattening into a wall or even focusing the sound downwards. That’s why sound travels further over water: less is lost up into the air, meaning more of it ends up in your ears — or your neighbors. A similar effect is responsible for the appearance of mirages in the desert or over hot asphalt, though the opposite happens. Light bends away from the ground (instead of toward it) because the air near the surface is hotter than the air above it. The temperature difference makes light from the sky (or distant mountaintops) bend upwards to reach your eyes, creating the illusion of a pool of water reflecting the light. Science isn’t really about cutting edge research and complicated experiments; those are just a means to and end. Science is an attempt to understand the world around us, and, whatever its flaws, it’s a powerful approach and certainly the best we’ve come up with so far. To me, it’s wonderful to come across reminders of that grand undertaking in everyday experiences like basking in the sun by the water’s edge.